From Within… is a journey into previously uncharted territory, combining influences from contemporary works for ensemble with the rich, raw and precise powers of current computer music. 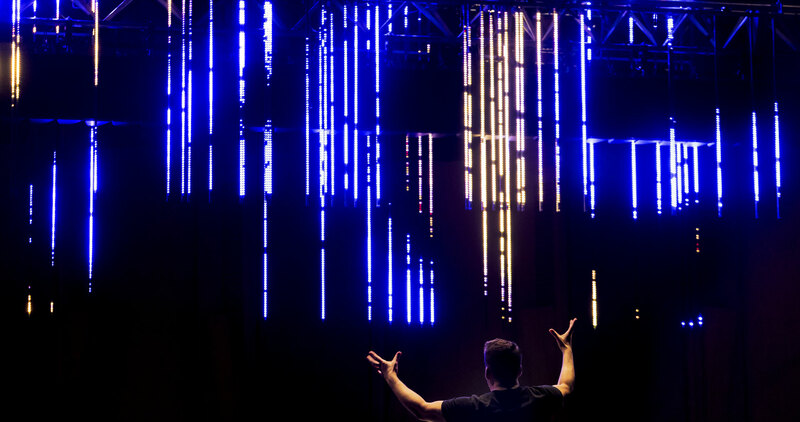 The pioneering usage of wave-field-synthesis and the integration of a sculpture of LEDs behind and above the ensemble creates a unique immersive audiovisual space. A commission by Ensemble Intercontemporain and IRCAM. Archaic and repetitive movements provoked by large tectonic shifts in structure take place alongside forces of contraction and expansion. Ephemeral, intimate moments suggesting a different and more static concept of time. The title refers to the core process of creativity: Bringing hidden ideas to the surface. It also evokes the picture of volcanic eruptions, of a strong force that has yet to be unleashed. Electronic sounds and the rich world of acoustic instruments merge into one beautiful, inseparable, complete and monolithic unity. Technology allows to define a rich sonic universe, ranging from near infrasonic bass frequencies to crystalline microscopic glitches, executed dynamically and with precision, matching and interacting with the acoustic abundance created by some of the world’s most talented instrumentalists. 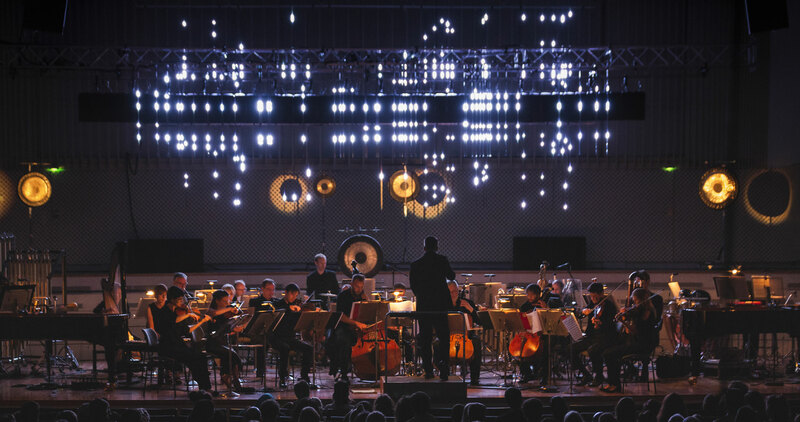 A LED sculpture created by Robert Henke is located above the ensemble, in front of and behind the iconic array of loudspeakers used to replicate the three-dimensional sound field. Light and movement are treated with the same amount of fine-grained detail and precision as the sonic part of the composition. 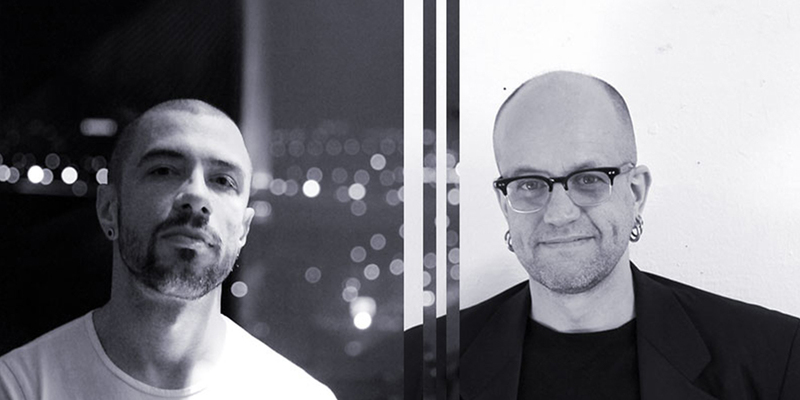 From Within..., is a collaboration between Robert Henke and Marko Nikodijevic, two artists coming from very diverse fields but sharing similar concepts and obsessions. Robert Henke was born 1969 in Munich an living in Berlin. 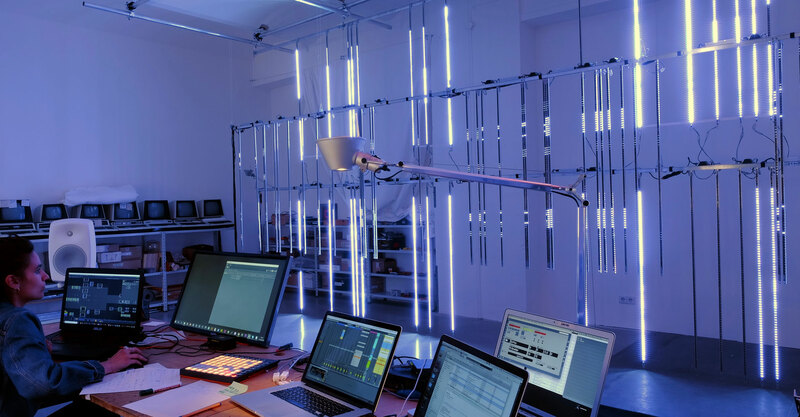 He is mostly known for his laser installations and performance works, and his musical contributions to the electronic scene in between club culture and sound art. Marko Nikodijevic was born in 1980 in Subotica, Serbia and studied composition in Belgrade with Zoran Eri" and Srdjan Hofman between 1995 and 2003. In addition, he attended courses and lectures in nonlinear mathematics and physics. Following his education in the Serbian capital, he undertook advanced training in composition with Marco Stroppa at the Academy of Music and the Performing Arts in Stuttgart in 2003. His compositional production has won prizes and awards at the International Young Composers Meeting in Apeldoorn, the Gaudeamus Music Week in Amsterdam, the 3rd Brandenburg Biennale and the UNESCO Rostrum of Composers. In 2013 Marko Nikodijevic received one of the three composition furtherance prizes of the Ernst von Siemens Music Foundation and in 2014 was awarded the Deutscher Musikautorenpreis (German Composers‘ Prize) in the category Promotion of New Talent. What unites Robert Henke and Marko Nikodijevic is their common interest in the evolution of timbre, in music as sonic state, in transitions, and sudden fractures. They both are obsessed with details as well as with grand and majestic gestures. From Within...’s visual component is an integral part of the composition, developed with the same care as the musical part of the score. It serves as counterpoint and complete ‘voice’ within the composition. An arrangement of LED stripes above the ensemble creates an immersive visual scenario that pulsates and interacts with the music, ranging from subtle colorisation to bright and overwhelming intensity. The visual sculpture deliberately avoids the association of video, there is no film: the focus instead being on color and immersion. 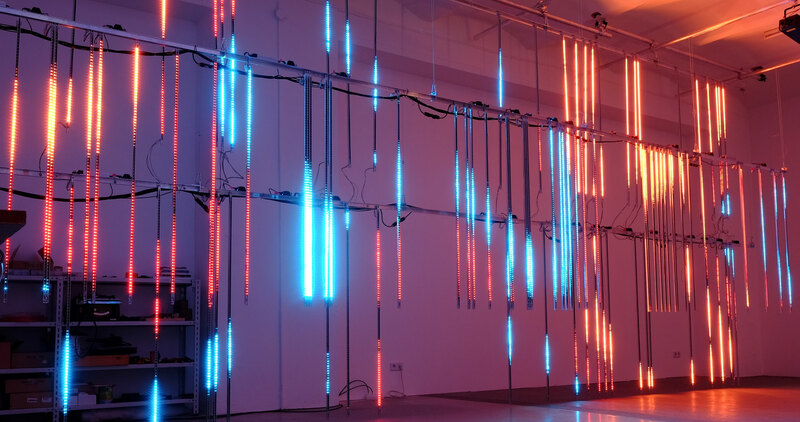 It consists of 96 lines of 85 RGB LED pixels, in two spatially distributed layers. 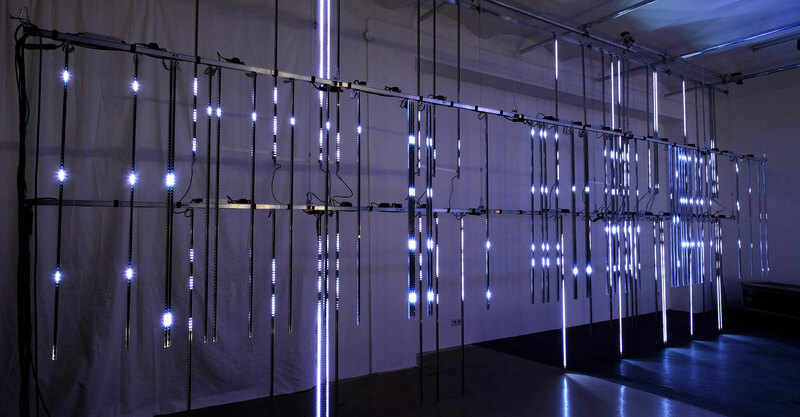 The LED sculpture is driven by the Touch Desginer sofware by the canadian company Derivative. Artistic direction and concept by Robert Henke, custom programming by Markus Heckmann and Selma Benramdane. Technical support and advice by Michael Sollinger and Steffen Wittig. Custom cables by Karin. Studio Robert Henke manufacturing crew: Sebastian Wolf and Gizem Oruc. Paris based, ‘Institut de Recherche et Coordination Acoustique/ Musique (IRCAM)’ provides their latest development for spatial sound distribution: a newly developed wave-field-synthesis algorithm, which allows to locate and blend electronic sound, processed sound sources from the orchestra and the sound of the acoustic instruments themselves with unprecedented detail and dynamics, using more than 60 loudspeakers placed on stage. d&b Audiotechnik, located in the south of Germany, is one of the worlds leading manufacturers of state of the art sound reinforcement systems with more than 35 years of experience. They provide the loudspeakers and amplification hardware necessary for this project, and the technical expertise necessary to operate it. This project is also a showcase of their latest audio processor technology, which is the central hub for all audio signals. From Within... is a work for a quite large ensemble, highly focused on rhythmical and micro-rhythmical movement. It is be performed by three percussion players, two grand pianos, and a full-grown string, brass and woodwind section. From Within... requires mastery in extended instrument performance techniques and perfection in detail. The Paris based Ensemble Intercontemporain, offers all this with the highest possible sophistication. It has been founded in 1976 by composer Pierre Boulez and is the leading ensemble for contemporary music, with a special focus on works for ensemble and electronics, as well as an interest in projects that interweave music, dance, theater, film, video and visual arts. From Within... is conducted by Ensemble Intercontemporain’s artistic director Matthias Pintscher.